Are you frustrated trying to pull value from high-level data? Need a way to see more in-depth that's visible to you and your sales team? Vizion offers solutions with apps that allow your entire team to be on board while re-establishing data integrity and giving you actionable reports. It can seem hopeless to harness the power of your data. Data solutions take a lot of time and many still manually operate their data analytics. This is a huge cost and can leave potentially detrimental gaps. At the end of the day, you need a data solution that is affordable, accurate, measurable, all inclusive and actionable. Being able to look at a report tailored to your departmental and positional needs, pull out an easy-to-find opportunity and act on it with ROI may sound too good to be true, but it isn't. Traditionally, data is a reactive element within business operations. However, simply being reactive about your reporting processes and metrics creates holes in your data and hides growth opportunities. Our tools provide in-depth visibility that allows you to be proactive in monitoring sales reps, customers and products. You're able to expose potential margin gaps and operational inefficiencies by customer, product and even customer/product groups or categories. 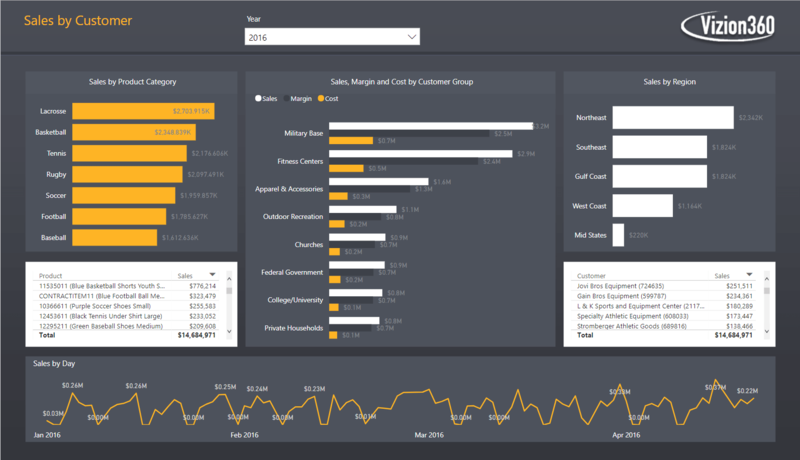 We are Microsoft Gold Partners and Tier 1 Cloud Service Providers of Power BI, so we are always up to date on the latest and greatest in business intelligence and data analytic solutions. BI solutions like customer/product profitability, customer focused apps and financial apps allow your firm to better your business from all sides. It's a win-win. Our reports allow you to drill down by sales, costs, gross margin, contribution margin, net profit, EBITDA and much more. Short-term fixes can negatively affect your market opportunities and current customers. We will help you compile data to focus the optimum level of resources on the right customers while maximizing the most profitable products in tandem. This provides long-term solutions that will improve profitability, increase productivity, manage risk and grow your top line. As a Sales Director, you know it's all about having the customer and product knowledge. Here's how our tools help increase and focus that knowledge. We focus on driving holistic customer and product views of revenue and costs in total. We use Microsoft-BI stack-multi-dimensional modeling that beats ERP base models capabilities. Solutions feature a profitability engine that assigns and distributes costs accurately. Our techniques are optimized to work with information delivery and actionable resources.